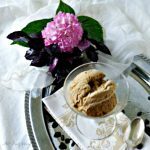 An easy creamy ice cream that is made by combining sweetened condensed milk with whipped cream and flavored with espresso and coffee liqueur. 1/3 cup coffee flavored liqueur -- we used Patrón Dark Coffee Liqueur with cocoa or use Kahlua. Pour the sweetened condensed evaporated milk into a large bowl and add the expresso and the liqueur. Whip the ingredients together until well mixed. Put in the refrigerator to stay cool. Pour the heavy whipping cream into a chilled bowl. Whip the cream starting off with low and working up to high. Once the whipping cream start to hold its shape stop beating. If you overheat you'll end up with butter. With a spatula fold the whipped cream into the cold flavored sweetened condensed milk. Keep folding in until it is completely mixed. Put the bowl into the freezer for about 30 to 45 minutes. Using the mixer, whip up the ice cream for a minute. Pour into freezer safe containers and freeze for 6 hours before serving.